Nursing assistant training equips students with skills that are always in demand in the healthcare industry. Students acquire the information and competency to provide basic nursing care to patients in a nursing home or hospital setting. The Kansas Department of Health and Environment (KDHE) requires students to complete a minimum 90 hours of didactic instruction and practical training at a clinical site in preparation for the competency test administered by Health Occupations Credentialing. Candidates who successfully pass the written and skills examination will be eligible for placement on the State’s Nurse Aide Registry. As nursing homes across the state suffer from staffing shortage, new CNAs will help fill the gap. Employment opportunities for CNAs will remain positive in response to the long-term care needs of the aging population. Additionally, new CNAs will be needed to fill vacancies left by current CNAs who move to other positions in health. 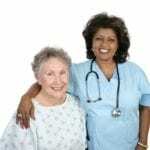 CNAs work under the direction of licensed practical nurses and registered nurses in hospitals, nursing homes, extended care facilities, and home health care agencies. The Certified Nursing Assistant course at the Kansas College of Nursing meets the requirements of the KDHE and prepares students for the Kansas State Certified Nurse Aide examination. The 96-clock hour course includes lectures, demonstrations and practice in a skills lab, and supervised clinical experiences in a nursing home. Applicants must provide a copy of their driver’s license or other valid photo ID, a copy of social security card, and a copy of a negative TB skin test or chest x-ray. Students accepted into the program must purchase navy blue scrubs for the clinical experience. Day, evening and weekend schedules are available for students’ convenience. Day classes meet from Monday through Thursday from 8:00 am to 2:30 pm; evening classes meet from 4:00 pm to 9:00 pm Monday through Thursday; weekend classes meet on Saturday and Sunday from 7:00 am to 4:00 pm. Students who successfully pass the CNA classes will be registered to take the state certification exam at Kansas College of Nursing. Tuition for the program is $720 plus $60 for the application fee and $30 for the course textbook. The computerized state exam costs $40. The Health Care Certificate at the Kansas City Kansas Community College is a career ladder course that offers an exit option for certified nursing assistants after the first semester. The entire three-semester course offers 34 credit hours. Students earn 12 credits after completing the first semester and are eligible to take the state certification exam to become employable as a Certified Nurse Aide. The first-semester curriculum includes modules in medical terminology, first aid, CPR, strategies for academic excellence, and certified nurse assisting. The CNA module is a 5-credit module that includes instruction in feeding and nutrition, patient transfers, ethical and legal principles, roles and responsibilities of the nursing assistant, end of life care, personal hygiene, and basic nursing care. A clinical experience at an approved nursing facilities helps students develop clinical skills that are an essential part of their role as a CNA. The Nursing Assistant course at Trinity Career Institute is designed for persons seeking to enter the healthcare industry as entry level employees. The 90-hour course includes classroom instruction, practical experiences in a skills lab, and supervised clinical experiences in an approved nursing facility. Course topics include medical terminology, anatomy, and physiology, laws and ethics, patient care, patient transfers, feeding and nutrition, communication skills, roles and responsibility of the nursing assistant, basic nursing skills, mental health concepts, and end of life care. Applicants must pass an entrance exam, physical exam, and TB skin test. Graduates are eligible to take the State of Kansas Nursing Assistant Certification Examination to work in acute care or long-term care facilities. The tuition costs $780; a $300 deposit is necessary for reserving a spot in the class. The CNA program at Delores Homes Training Center is available as a day, evening, or weekend option to fit the working individual’s schedule. Small class sizes, limited to 10 students, ensure students receive individualized attention. The curriculum follows Kansas State guidelines for nursing assistant students, offering instruction in the classroom, demonstration and practice in a skills lab, and opportunities to provide patient care under the direction of an experienced nurse in a skilled nursing facility. Applicants must possess a high school diploma or GED (or college transcript) and a valid photo ID and social security card. Applicants with no high school diploma or GED can schedule a free reading test at the school’s office. In addition to a completed application, the prospective student must make a $350 deposit at the time of enrollment to reserve a seat. The tuition is $700 inclusive of the textbook and state testing fee. Students must budget for uniform, clinical supplies, and transport to the clinical site. The nursing assistant program at Midwestern College prepares students to provide basic nursing care in a long-term or acute care facility under the supervision of a licensed nurse. The course includes 90 hours of combined classroom and practical instruction in a nursing home. Prior to enrollment, applicants must submit a copy of their driver’s license or another valid photo ID, a copy of their social security card, and a copy of the a negative TB test. Students must purchase official school scrubs for the classroom and clinical sessions. State policies require students to attend all classes and clinical sessions. Those who meet the attendance requirements and complete the program with a passing grade will be scheduled to take the state test. The state test costs $40 which is collected with the tuition payment.